Do You Need New Data Points in Chermside? Call Internet Magic Today! Do you need a good, reliable internet connection in your Chermide home or business? Do you need more Data Points to keep up with a growing company or organisation? Do you need multiple Data Points or Phone points installted, or installed in hard-to-get-to places? If you answered yes to any of these, then you need internet Magic. What Does Internet Magic Do For Me? 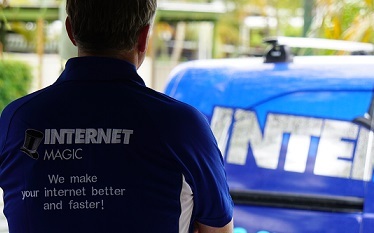 Hi I'm Doug, your local Internet Magic Technician in Chermside. After gaining years of experience in the IT industry, I chose to launch Internet Magic to meet the needs of customers just liek yourself. I know how hard it is to get by without a strong internet connection, and many people who beleive they are not capable of having one continue to put up with slow or non-existent internet when they don't have to. Among other internet solutions, I can install as many data points as you want, wherever you want them and help you connect to fast and reliable internet to make you more productive in your daily activities. Why is a Strong Internet Connection so Important? A strong internet connection is almost neccessary if you want to get through every day tasks with ease. Imagine trying to organise an important work presentation without the internet. Not only would it be very difficult and time consuming to do any research that was necessary, but it might also mean that you don't get your work project submitted on time, which could have some undesirable consequences. Why put yourself through all that stress and hassle when you can have faster internet that makes life easier? With just one easy phone call to Internet Magic Chermside,I can have all your Data Point and Phone Points sorted so you can get back to being productive!